Benedict Cumberbatch is probably the biggest thing going in movies at the moment and his newest role as Alan Turing may put him on the Oscar shortlist. Norwegian director Morten Tyldum, with a screenplay by Graham Moore adapted from the biography by Andrew Hodges, Alan Turing: The Enigma, won the People's Choice Award for Best Film at the 39th Toronto International Film Festival. It's a interesting, and engaging piece of little known history that is sometimes formulaic, but still satisfying. 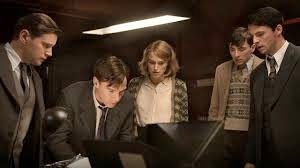 The movie flashes forward and backwards in Turing's life from the investigation of being a homosexual, to his bullied childhood and first crush at boarding school, and mostly involved in cracking the Enigma machine that baffled cryptographers during World War II. Turing was a mathematician, logician, cryptanalyst, practically the inventor of the computer and crossword enthusiast. He was recruited to work at the top secret Government Code and Cypher School at Bletchley Park with other top mathematicians who he immediately alienates with his prickly personality. They dislike him so much they want to kick him off the team, but he takes his ideas directly to Winston Churchill who assigns him as the lead to create the machine that Turning believes will decipher the code that changes everyday at midnight. Woven into the story is the inclusion of Keira Knightley as Joan Clarke, who fights to work on the top secret team by solving a puzzle created by Turing that was even faster than himself. The prevailing sexism of the time forces her to lie to her parents that she is working as a secretary at a radio factory. She was also the only one who is not annoyed by Turning arrogance. The pressure is on the team, Matthew Goode as Hugh Alexander, Allen Leech as John Cairncross, and Matthew Beard as Peter Hilton, who work their number magic by hand everyday through 3000 Enigma generated naval codes a day. They are frustrated by Turing who is building the computer which he claims will do the same job. The base commander Cdr. Alastair Denniston (Charles Dance) is ready to shut him down as the machine requires a huge monetary budget that has yet to produce any result. Maj. Gen. Stewart Menzies (Mark Strong) is the secret MI6 agent who supports Turing's work.